Photo by Tom Frohnhofer in the Londonist Flickr pool. Home secretary Theresa May has postponed a decision on the use of water cannon by the Metropolitan Police until after the general election. “It’s time for the Mayor to accept he was wrong and to sell the water cannon he has already bought so we can reinvest the money in things the Metropolitan Police actually need. “We have made our case, which Londoners support, and as the police have repeatedly said, it is very unlikely that water cannon will be needed. 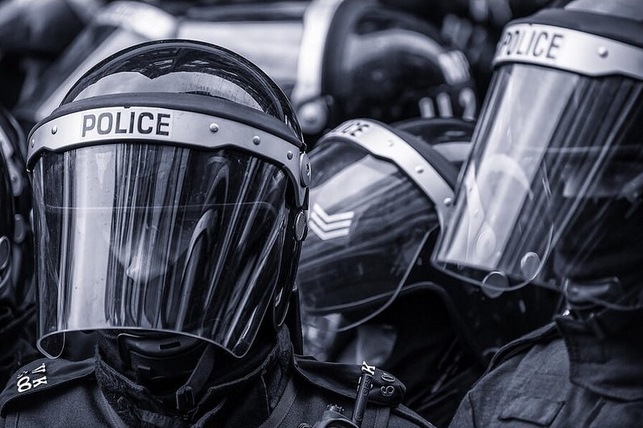 “In emergency situations, such as the 2011 riots, where order breaks down, missiles are being thrown and shops looted by mobs, the police would benefit from having sound cannon. Costing as little as £18k, 25 times cheaper than water cannon, they look like satellite dishes and emit a targeted, high pitched alarm tone in short bursts." Sound cannons, also known as Long Range Acoustic Devices (LRAD), emit high frequency sound waves up to 149 decibels. Police in the US have used them, but the devices have been criticised over the potential damage they can cause to hearing. With the Mayor's policing budget in ever-increasing decline, we can think of better things to have spent £218,000 on. Still, at least they'll have something to water the Garden Bridge with.